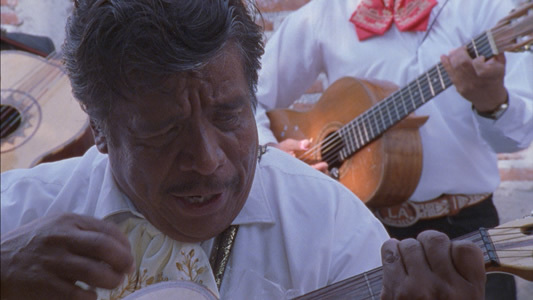 When Mark Becker started interviewing subjects for a documentary short about the mariachi singers who were working the taquerias and hipster clubs in San Francisco’s Hispanic Mission District, he stumbled upon a 54-year-old Mexican immigrant named Carmelo Muniz Sanchez. Becker knew early on that he had found someone who could carry the weight of a full-length documentary. Perhaps with a similar instinct, Carmelo saw the opportunity that Becker presented, and he gave of himself willingly and without barriers. Together, the two men have made a moving document of one man’s life of hardship defined by poverty, and yet enriched by the existential journey of the human spirit. Carmelo’s story is not atypical of the illegal Mexican immigrant experience, but it resonates with heartbreaking sentiment due to Carmelo’s earnestness and emotional availability on the screen. His deeply creviced face looks sincerely at Becker, his quasi confessor behind the camera, as he recounts his life of struggles with a candor that is mesmerizing. Becker’s camera follows Carmelo as he trudges through his daily task to earn money for his family, and Carmelo conveys a sense of humility and acceptance tinged with a weariness that makes our hearts tighten with sympathy for him. In a development that occurs early on, Carmelo decides to return to the family he left three years earlier to find work in the States. His mother, now blind and legless from the effects of diabetes, is dying, and Carmelo also misses his two young daughters. In a kind of immigrant’s tale in reverse, Becker follows Carmelo back to Mexico. The rest of the documentary takes place in Carmelo’s hometown of Salvatierra nearly a thousand miles south of the border, where Carmelo reunites with his wife and two daughters, aged 11 and 14. After seeing the dismal existence Carmelo endures while in San Francisco, his Mexican home seems luxurious in comparison. The rustic atmosphere of Salvatierra feels quaint and idyllic, so when Carmelo talks of returning to San Francisco, viewers might be led to wonder why he would consider leaving the relative comfort of this life to return to the harsh immigrant life he had in the States. But when we see Carmelo singing for prostitutes and their clients in bars, or peddling fruit ices on the streets to make extra money, we begin to realize the poverty he and his family just barely skirt in their everyday lives. Yes, they have plenty of tortillas; the girls go to school, and their home is solid and furnished. But Carmelo knows that he is aging and his ability to care for them grows more uncertain with the years. We find out that he, too, is a diabetic like his mother; when he wraps his swollen leg, Carmelo’s fears are laid bare in a voice over filled with the knowledge of his tenuous hold on life. He refuses to ask for our pity, just as Becker with his camera refuses to indulge in easy sentiment. There is too much dignity in Carmelo’s resignation, and Becker respects it by refusing to exploit his condition for obvious emotional impact. The point is not the hardship itself, but the struggle to surmount it. This gesture to not make Carmelo into a martyr, or a victim, is helped throughout by Becker’s decision to lace the film with scenes of Carmelo at work, playing guitar and singing Spanish love songs in his strong tenor voice. English translations of the songs are provided in subtitles, so we are able to immerse ourselves in the inherent beauty of these romantic odes to love, passion, jealousy and grief—all the feelings that bring life its joys and sorrows. The songs are a counterpoint to Carmelo’s day-to-day existence. Above all, they add to our sense of Carmelo as a romantic—romantico—someone whose vision of the world allows him to let his subjective experience transcend the otherwise harsh limitations of mere existence, especially the physical limitations of poverty. Becker’s aesthetic reveals his own romantic predilection. His style is loose and fluid; he minimizes the classical use of talking heads interviews, and instead allows Carmelo’s voice-over to highlight ordinary images. The effect is obvious—we feel like we are inside Carmelo’s head, and the intimacy of the moment is all the more stirring. It doesn’t hurt that Carmelo’s voice-over is poetic in both rhythm and theme. Perhaps it was due to his years as a singer, but he has a poet’s heart and soul. In one particular scene, Becker has Carmelo standing still in a plaza while he films in high speed, making the people around him move in fast motion. In voice over, Carmelo recounts a period in his life when depression left him angry and demoralized. He tells how a decade of agonized soul-searching brought him to the healing powers of his Catholic faith. In a matter of a few minutes and a simple special effect, Becker encapsulates Carmelo’s anguish and redemption with a poet’s piercing brevity. Becker’s insistence on filming in 16mm and super 16 also hints at a romantic bent. Unlike the now ubiquitous digital video format that documentaries choose out of financial necessity, film has a lot of grain, a distinctively rich color palette and sense of depth that is unmistakable. One could see Becker’s decision to shoot in film as a romantic gesture—it shows a more lyrical concern with atmosphere, mood and expressiveness over the more prosaic concern of most documentaries with the practicalities of presenting a cultural and social reality. Becker’s artistic inclinations give Romantico a richness of tone and meaning that elevate the story of Carmelo beyond its humble origins. And strengthened by Carmelo’s own romantic vision, both in words and action, the movie transforms from a record of a simple man’s meager existence into a paean to what is good and vital about the human spirit. It is like a duet in which both men work together to achieve a kind of cinematic harmony, and out of it comes a beautiful recording of the universal struggle that is life. This brave little film received a lot of praise during its festival run, and has made its subject a star in his hometown, where he is being offered more singing gigs as a result. Let’s hope that Carmelo’s newfound celebrity will help him in his final years. It is a nod to practicality, but what a reward if this film should help ease the burden Carmelo has carried with such grace and dignity for so long.